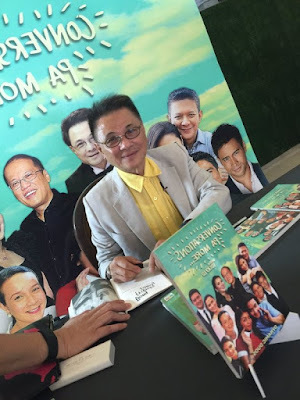 TOPNOTCH #ENTERTAINMENT writer-editor Ricky Lo has just launched his latest book, “Conversations Pa More.” Ricky’s earlier two #books were “Star Studied” and “Conversations,” both best sellers, just at the third promises to be an even bigger blockbuster. Published by VRJ Books, the new publishing arm of #Viva Communications, “Conversations Pa More” is now available in National #Bookstore and Powerbooks. You’d be thoroughly entertained reading Ricky’s compilations of his widely followed interviews with about 60 stars. His interviewees include Chiz Escudero and Heart Evangelista, Grace and Lovi Poe, Piolo Pascual and Sam Milby, Alden Richards and Maine Mendoza, Dingdong Dantes and Marian Rivera, Edu and Luis Manzano, Manny and Cynthia Villar, Mother Lily and Father Remy Monteverde, Albert and Liezel Martinez, James Yap and Michela Cazzola, Helen Gamboa and Tito Sotto, The Gutierrezes, Martin Nievera and Gary Valenciano, Pilita Corrales and the two Carmens, Soriano and Pateña, Carmina Villaroel and Zoren Legaspi, Pres. Noynoy and Kris Aquino and others.